Personal Property to include Antiques/Collectibles, Guns, Furniture, Tools, Box Lots and more. See below. 3 Bedroom & 2 bathroom single family home that contains 1370 sq. ft. of living space. Call 717-286-8282 to schedule a walk through the house. Aluminumware, wooden boxes, luggage, coo-coo clock, collection of Newcomer Oil Etown Pa. advertising, primitives, sewing machines, scrapbooks, adult art & pics, other local advertising, dough boy lamp, Atlantic wash boiler, hay hook, wooden pulleys, grain-painted wood box, decanters, steins, bottles, antique wooden tub washing machine, animal calls, paper advertising, early photos, postcards, costume jewelry, cast iron mold pans, Fostoria Glass, fluid lamps, hanging lights, Atlantic White Flash Gas Pump front, slaw boards, early jars, glass gallon jars, wooden barrels, box lots, and much more! Too many things to list. steamer trunks, cedar blanket chests, grain-painted Manheim-style blanket chest, paint-decorated chairs, cane-seated chairs, oak child's desk, Empire dresser, filing cabinet, early kitchen table w/ extra boards, drop-leaf tables, quilt rack, misc. dressers, misc. end tables, oak dresser, vintage marble-top fancy end table, 3 piece vintage upholstered set, antique buggy bench, antique wall mirror, stools, beautiful Ridgeway Centennial Statue of Liberty Limited Edition Grandfather's Clock, storage cabinets, card tables, Mahogany china hutch, tables, carpenter's chest, wooden deacon's benches from Florin church, 2 matching oak benches from the Kennywood Hotel Etown Pa., and misc. rockers. hand tools, power tools, cookers, early gauges, small bench top break, metal ammo boxes, early bows with arrows, picnic table, charboil grill, wheelbarrow, bench grinder, pocket knives, extension ladders, refrigerator, Whirlpool washer, GE dryer & more. Much more available live only that is not online. Scroll below for online catalog. 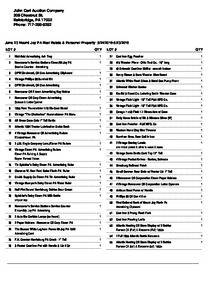 Download "JUNE 23 AUCTION CATALOG.pdf"